I recently had the opportunity to interview Anna Russell, who has played a significant role in this season’s production of “A Chorus Line.” Anna is currently one of Playhouse on Park’s summer interns, as well as a cut dancer in the show and an understudy for four characters. Anna, taken on the night she went on as Cassie! I was born in Sacramento, California and my mom is a costume designer, so I’ve been involved in theater my whole life. I started doing theater when I was eight and danced for a while, took a break, and started dancing seriously when I was a freshman in high school. I just finished my sophomore year at the Hartt School where I’m studying musical theater. I’m a cut dancer, an intern, and I understudy Diana, Cassie, Connie, and Sheila. I also work in the literary and marketing department as well as the box office. What is the process like rehearsing and performing as an understudy and cut dancer? Well being a cut dancer is simple. You do the opening, get cut, and that’s that. Understudying is different because I have so many different parts to learn. I did a lot of color coding my notes and writing things down quickly during rehearsal, and afterwards I would go back and organize it all. For the big numbers I would primarily write down where everybody was in formation and if there were any different counts or ripples. So did you have a chance to practice filling in for different characters in rehearsals? No, you don’t really get to practice with anyone else. You just practice by yourself. I would go in early to practice all the parts before so I knew it all just in case. Have you gotten to fill in for anyone else yet? Yes, I went on for Cassie a few weeks ago for two nights. It was terrifying, but also the best feeling in the world. As an understudy, you never really expect to go on. You just expect everything to be ok. And Michelle is the last person I would have expected to get sick, and that’s something you can’t control. So it was definitely scary because it’s one of those experiences I never thought would happen, but once I got past that, it was amazing and thrilling to actually be in the show for the whole time. What was the most challenging part of performing as an understudy? Well I knew all the tracks, so that was fine, and even the group numbers went well because the cast members were so good about getting me where I needed to be, even when I was in the wrong place. But I think the hardest part is that I’m not even twenty yet, and Cassie is so much older and mature. So I worked for about four or five hours before the show with Sean, just going over the two main scenes that she has. We worked mostly on trying to find the emotional depth that she has as an adult because that’s really not me as a person. I think that was the hardest part, just tapping into that older side of myself and learning to be an adult. Do you have any additional hobbies and interests? I’ve always loved to read, and I’m also really interested in women’s issues and gender roles. I would really like to someday use the arts in a way that informs society about the issues that surround women nowadays. I think that it’s really important as an artist to use what you do to aid a cause you believe in, so that is one of my top goals for the future. Do you have any advice for aspiring actors and singers? I would say that the biggest thing is to work as hard as you can because your work ethic directly affects how well you do. It’s also really important to just be a nice person. There are so many times where I see actors who decide not to be nice people, and it makes me not want to work with them. And I think that’s true for anybody and everybody you work with. Also, I believe that you should make sure to take every opportunity that you can, but only if you truly believe in what you’re doing. If you’re doing something you don’t love, it can be really hard to continue doing that. Every recent grad has that feeling. That feeling that’s eloquently described in the opening number: “God, I hope I get it!” I’m a recent grad still living that. It’s tough, constantly being at war with the fact that you’re “too young to take over and too old to ignore.” We all have a story that we could share if we were sitting in that audition. A life changing personal experience that shaped us both personally and professionally. Every year there’s a new generation of fresh faces ready to prove that they’re worth the money. A new crop of people begging to be allowed to do a job. That’s why this show is timeless. It will never matter what year the current actors were born in. As long as we are growing and learning there will always be a moment when we look to the future and wonder what’s in store. This is why Playhouse on Park is the perfect place to do this show. The Playhouse has made a serious commitment to arts education. In fact, its co-artistic directors are educators! The cast of a Chorus Line is mostly made up of students and recent graduates, acting alongside two seasoned equity actors. Playhouse no Park is a place of growth and learning, a place of discovery and confidence-building. And the learning doesn’t stop at the stage: Playhouse on Park finds new ways to educate and engage audiences of all ages. So, when you come out to see A Chorus Line and are dazzled by the amazing choreography and bold directorial choices, be aware that you are also witnessing the passion and talent of recent graduates who have been given the opportunity to shine as a professional who loves their craft. In the days leading up to opening night of “A Chorus Line,” the cast was still hard at work putting on the final touches during their last few rehearsals. Over the past few weeks, the group has spent long days and nights preparing for this massive production, and all of that work has paid off as the show’s run is well underway on the Playhouse stage. A typical rehearsal usually begins with a thorough dance warm up by choreographer, Darlene Zoller, where cast members get their bodies ready to start the day with a series of stretches and strengthening exercises. Next, dance material is reviewed in depth to ensure that everything from last rehearsal can be perfected, followed by a fresh batch of new choreography and scenes. Even though rehearsing five days a week and eight hours a day sounds like plenty of time, when there’s only three weeks to get ready for the show, every minute must be used carefully. A few weeks ago, I was lucky enough to be able to attend a rehearsal when the cast was working on the show’s iconic finale scene, “One.” When I walked into the studio space I was pleased to see everyone chatting and joking together like they had known each other for years. (Of course, considering they had been spending nearly every waking minute together, it wasn’t too surprising). Despite having a good time together, when it was time to start rehearsing, everyone was able to successfully put their conversations aside and focus on the task ahead. Being able to see a rehearsal in person really put into terms how much of a challenge putting on this show truly is. I could tell that the biggest trial for the actors is how demanding and precise the choreography is for something that must be learned in a matter of weeks. Not only must the cast be able to remember every step and formation, but they also must be aware of every leg angle, pointed toe, and hat movement. In order to achieve those sought-after moments of impeccable synchronization, everything must be picture perfect. Make sure you secure tickets for A Chorus Line (running ’til July 31) so you can see how this demanding rehearsal process translates into a phenomenal show! Get your jazz hands ready and your top hats on because we are less than two weeks away from Playhouse on Park’s summer premiere of “A Chorus Line!” With only two weeks of rehearsal time, twenty-five actors, and the challenge of putting on one of the most iconic musicals of the twentieth century, this performance will surely be one of the largest and most rewarding premieres that the Playhouse has ever seen. A portion of the cast during the meet and greet at the Playhouse. Set in the 1970s, “A Chorus Line” follows the individual stories of Broadway hopefuls as they audition for parts in the chorus of an upcoming production. As cuts are made and only seventeen candidates remain, each begins to tell their stories of what brought them to audition in the first place. Featured in the production are many notable musical performances including, “I Hope I Get It,” “One,” “I Can Do That,” “Dance: Ten; Looks: Three,” “At The Ballet,” “The Music and The Mirror,” and many more. However, before the actors can take the stage of this highly anticipated production, there is much to be done. And like those auditioning in “A Chorus Line,” we all have to start at the bottom to reach the top. That’s where I come in. This summer I will be interning with the Playhouse and documenting my experiences behind the scenes. Over the next few weeks, I will be attending rehearsals, speaking with actors and directors, and working behind the scenes to see just how this musical can go from songs on paper to an enormous live performance. In the past I have attended a few of Playhouse on Park’s musical performances, and was absolutely blown away by the sheer talent of the actors and the genius that went into each show’s direction. Because of this, I have high expectations for what the Playhouse has in store for us in their rendition of this classic musical and am so excited to see what twist they put on it. Co-Director Sean Harris shares his vision for the show as Stage Manager Mollie Cook and Co-Director and Choreographer Darlene Zoller look on. L->R: Music Director Mike Morris, Playhouse Executive Director Tracy Flater, Co-Director Sean Harris, Music Director Emmett Drake, Stage Manager Mollie Cook. Make sure to keep checking in for updates on the progress of the show, and I can’t wait to see you at the Playhouse when “A Chorus Line” premieres on June 17th! Interested in Subscribing to Season 6? Hear From One of Our Current Subscribers! 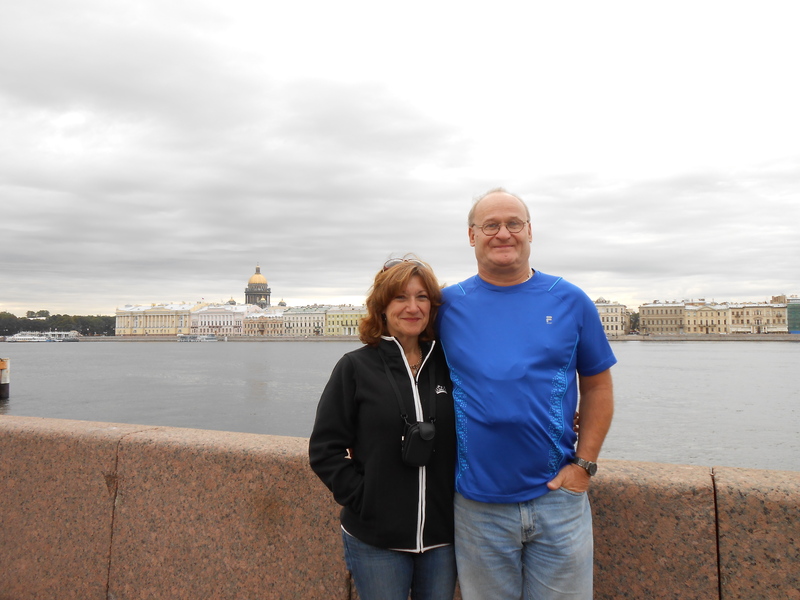 What makes Dorene a devoted subscriber is her choice to attend shows numerous times throughout their run. For example, Dorene saw the production of Cabaret twice. Our choreographer, Darlene Zoller, was voted CT’s best choreographer in 2013 by broadwayworld.com for that production. In Dorene’s opinion, Cabaret was memorable because of the journey the audience experiences and how it evoked different reactions from the audience. “I giggled a bit when the actors were mingling with the audience only to be quiet and almost speechless at the end of the amazing performance.” Dorene has had numerous experiences at Playhouse on Park that she and her husband still discuss to this day. Notable performances include their close proximity to Art Garfunkel when he performed at our theater, as well as the production of An Enemy of the People, which left Dorene and her husband thinking for days. Dorene can’t choose a favorite production or specific season, although Around the World in 80 Days will always hold a special place in her heart, the performance that made her “fall in love with Playhouse on Park.” While she is already a subscriber, she donates when she can. Do you enjoy receiving updates and getting a behind-the-scenes look at Playhouse on Park? Subscribe to our blog to receive notifications about the latest posts and news! 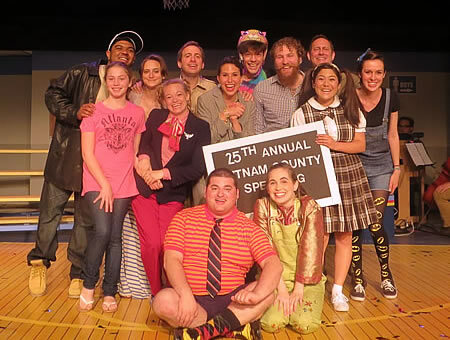 For me, The 25th Annual Putnam County Spelling Bee is one of those shows that makes my mouth hurt from smiling so much. I first saw the production on Broadway as a freshman in high school when our acting teacher and current Artistic Director at the Playhouse, Sean Harris, took the drama department to see the show. He was invited to be a guest speller, we had the privilege of attending a session with the production’s understudy for Marcy Park, as well as the privilege of seeing Jesse Tyler Ferguson play Leaf Coneybear. That was the first show I saw on Broadway and it was a magical experience. Since, I’ve never forgotten Spelling Bee. I didn’t hesitate to see my friend perform in Clark University’s production of the show, and I revisit the music when it strikes my fancy. I was thrilled to hear when the Playhouse announced they would put on this production to close out our fifth season. I knew it was going to be a fabulous run and wanted to be a part of my favorite musical somehow. On opening night, I was signed up to be a guest speller. Perhaps wearing overalls was an advantage in getting chosen. I digress. Being a guest speller is a wonderful way of having the opportunity to participate in Spelling Bee. I had to answer a few questions before I was selected, a short bio that the moderators could use to poke fun at the guest spellers as they’re called to the mic. Those selected were given a list of reminders to help prepare us for our participation onstage. We were able to sit in our audience seats until the guidance counselor called us for a conference at the beginning of the show, reminding us of the rules and handing us number tags to wear around our necks to match the spellers in the cast. Then we were ushered onstage, where the spellers directed us where to sit on the bleachers. I sat next to Marcy Park, who was convincingly portrayed as intense and intimidating by Maya Naff. I hummed instead of sang along to “The Spelling Rules,” one of the moments where it was hard to not break into one of the songbook’s infectious tunes. Guest spellers were encouraged to be ourselves and not overact or be a ham, anyway. The first word that I was selected to spell was “apoop.” As I was directed to, I asked for the definition and for Vice Principal Panch to use it in a sentence. What tricked me was the sentence, “Guido the seasick Italian sailor said, “Excuse me boys, but I have to go apoop.” The stereotypical Italian accent and Panch’s initial delivery of the word prompted me to spell the word as “poop.” Panch repeated the word for me after I finished spelling and allowed me to spell it again, probably to save me from the humiliation of getting out of the competition so early. The second word that I had to spell was “crapaud.” Since I was familiar with Spelling Bee’s adult content, I was prepared for some adult humor from the word selections. However, being unfamiliar with the word, I heard it as “craphole” and spelled it as such. When I was mulling over how to spell the word, I tried telepathically communicating with Panch to see if he really wanted me to utter the word “craphole” out loud. And no, telepathically pleading with an actor does not work. Panch looked at me stoically and patiently before I gave my final answer. Being a guest speller is nerveracking, even with the forewarning. I was cut from the competition because of my dirty mind. While onstage for the majority of the first act, I thoroughly enjoyed my experience. I jumped from my seat when Mitch Mahoney turned to the spellers and pounded his chest in a threatening way. “Pandemonium” was literally pandemonium when the spellers shuffled the guest spellers along the stage, even rolling us on the bleachers like an amusement park ride. I wasn’t too disappointed when I was disqualified and received a certificate and Hi-C (not apple juice) juice box, a sugary “juice” my mother refused to purchase when I was a kid. Viewing the rest of the show from my stage left seat of the three-quarter thrust was a treat in itself. I’ve always regarded being a live theater actor as one of the toughest professions, due to the consecutive performances and repetitiveness their job requires. Luckily, Spelling Bee has the advantage of allotted room for improv, allowing for something different at every performance. I decided to see this show at the Playhouse a second time near the end of its run, in order to watch it from my audience seat in full as well as see the progress it has made since opening night. Since we extended the show’s run, the cast has been able to work on their portrayals at every performance, improving more and more. And when I saw it a second time, I was not surprised to see an excellent and compelling performance. When I saw the determined and focused look in Maya Naff’s eyes, I knew she has delivered as Marcy Park every performance. When I heard Natalie Sannes hit that very high note during “The I Love You Song,” I knew she can reach it every time without difficulty. And when I witnessed Logainne SchwartzandGrubenierre get disqualified, I knew Hillary Ekwall’s tears were real. The main differences I noticed only were the order of the words chosen for each guest speller, the time at which the guest spellers took a photo with the cast, and the type of relationship between Rona Lisa Peretti and Vice Principal Douglas Panch. Though, the reveal in Peretti and Panch’s epilogues about Panch’s restraining order being undetectable throughout the show might be the fault of the playwrights and not the actors. The great thing about Spelling Bee is that even in this fictitious world, the characters come to life. Steven Mooney did a wonderful job at convincing me to like William Barfee, although some would argue that Barfee isn’t supposed to be a likable character. I was also happy to see Steven’s hair grow back to resemble Barfee’s curly hair. Costume designer Collette C. Benoit did a terrific job with the costumes, bringing out each character’s specific quirks from Olive’s silk top to Logainne’s star-spangled canvas shoes. The characters were zany, heartfelt, and the actors’ love for them was definitely apparent. I could see why they would want to sign on to play teenagers for a little over a month. Spelling Bee creates a world that feels human. We laugh, we cry. Even as an audience member, it’s a world that’s hard to leave. Do you enjoy receiving updates and getting a behind-the-scenes look at Playhouse on Park?Subscribe to our blog to receive notifications about the latest posts and news! With California Chrome dominating the sports news as the latest contender for the Triple Crown, another legendary horse comes to mind when contemplating the history of Playhouse on Park, celebrating its fifth anniversary this month. The story of Seabiscuit depicts three people whose lives and aspirations intertwine and converge in their pursuit of a shared dream. 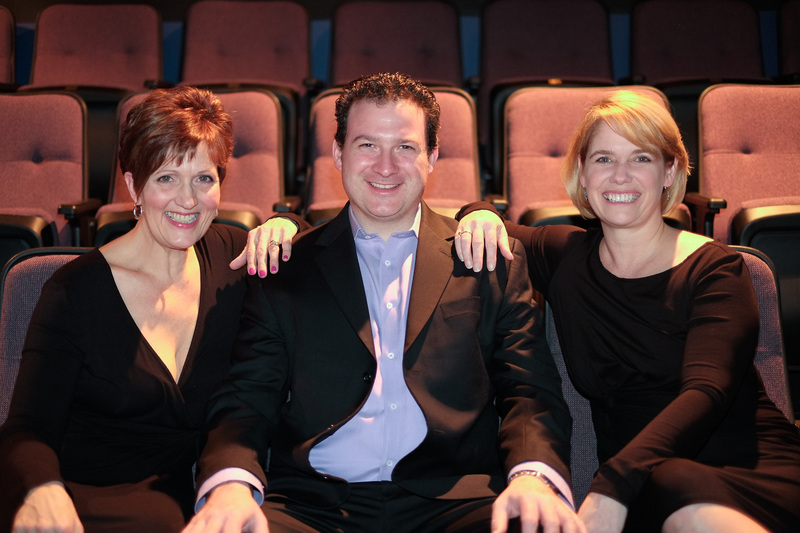 The three founders of Playhouse on Park had a big dream of their own five years ago: to found a professional regional theater in Connecticut. Five years is significant in the life of a new theater. “Everybody we spoke to in the early days said it takes five to seven years for a theater company to stabilize, when you know you’re going to make it,” says Tracy Flater, executive director. “As we hit five years, so much hard work is paying off,” she added, noting the increase in season ticket holders and growing interest from corporate donors. The work began in early 2009 when Flater and co-founders/co-artistic directors Darlene Zoller and Sean Harris formed a partnership and began to shape the vision they believed would take three to four years to fully realize. An unexpected opportunity shrank the schedule from several years to a few weeks: Park Road Playhouse in West Hartford went out of business. Zoller had been looking for a venue to stage a show that would demonstrate their vision for potential investors. When she approached Catherine Denton, the landlord of the bankrupt theater, Denton suggested that they take over the space. Despite the recessionary times, the three founders believed they could beat the odds. They agreed to lease the theater and moved in on June 1, 2009. The venue was renamed Playhouse on Park, signaling a change in identity from a community theater to a professional theater. Their goal was to provide high-quality entertainment and a diverse selection of offerings at affordable prices. Like any startup, Playhouse on Park had to overcome countless obstacles in the early days. “The night before we moved in somebody stole many of the lights,” said Flater. “From the moment we moved in we had such amazing hurdles,” she added, recalling a benefactor who promised them a $25,000 grant and then reneged a few days later. In spite of these and numerous other setbacks, the founders forged ahead full speed, staging an ambitious lineup of eight shows in the first year. They backed it down to a more manageable five the following year, and gradually added more shows in subsequent years as their finances and reputation grew. In the upcoming season Playhouse on Park’s main stage will feature seven plays including Angels in America, Altar Boyz, Proof, The Dining Room, The Importance of Being Earnest and Hair. “All the plays we chose for next year have great roles for every actor,” said Harris. “They are all immersive pieces.” The stop/time dance theater rounds out the season with its annual dance musical revue. Playhouse on Park is the only professional regional theater in Connecticut with its own resident dance company. The interactive experience begins even before the play, when one enters the small but comfortable lobby, furnished with cozy leather couches and walls covered with colorful production shots. The three principals are on hand to welcome first-timers and greet season ticket holders. Performances are prefaced with friendly, engaging “curtain talks” from the founders, offering inside information about the play and the playhouse. Many performances feature a talkback with the actors after the show, giving the audience a chance to ask questions and give feedback. Playhouse on Park feels hospitable and personal. “Everything is about the community,” said Harris. Highlighting the community aspect, Playhouse on Park casts all shows using both Equity and non-union professional actors. The hybrid model, inviting participation from professional community actors as well as union actors, is a source of pride for the founders and exemplifies their mission to embrace the community, and be embraced by it in return. This commitment extends to youth in the community, from kindergarten through college, with Theater for Young Audiences performances, educational experiences and internship opportunities that give students an immersion in theater arts. On Tuesday May 20th, Playhouse on Park honored the ‘Founding Five,’ the five individuals who have supported the theater from the beginning, at the Governor’s residence: Ron Roy, David Wurzer, Chuck Coursey, Catherine Denton and Jeff Dornenburg and Tod Kallenbach of Dornenburg Kallenbach Advertising. Playhouse on Park invites you to join the celebration at its 5th Anniversary party on Thursday June 5th from 6-10pm at the Pond House Café, 1555 Asylum Avenue, Hartford. Tickets are $50 (cash bar). Visit www.playhouseonpark.org or call 860-523-5900 ext. 10 for more information. Do you enjoy receiving updates and getting a behind-the-scenes look at Playhouse on Park? Subscribe to our blog to receive notifications about the latest posts and news!